Great news! History Colorado’s Photography Department has finished unpacking and re-housing our entire glass plate negative collection! For the first time ever, this collection made up of hundreds of thousands of glass negatives is now available for research and photo reproductions. The project took two years to complete and involved the hard work of Megan Friedel, Emily Moazami, Melissa de Bie, Bridget O'Toole, Natalie Elder, Kalyani Fernando, Becca Goodrum, Sarah Plimpton and Charlotte Whitman. The glass plate negative collection is actually made up of many individual collections shot by talented professional and amateur photographers. These one-of-a-kind negatives are very diverse in subject matter and provide a rare visual documentation of the vast changes that occurred in Colorado in the 19th and 20th centuries. Are you interested in portraits of Colorado residents? Mining? Landscapes? Railroads? Agriculture? Industry? We have all these subjects and many, many more! Here, for example, is a negative we unpacked featuring Teddy Roosevelt in Colorado. Glass plate negatives were the predecessor to film negatives and were created from approximately 1847 through 1940. The plates of glass were either coated with light-sensitive chemicals by the photographer before he/she wanted to take the photograph (wet plate process) or the glass plates were pre-coated by photo manufacturers such as Kodak (dry plate process). The photographer then exposed the image in the camera and developed the negative. 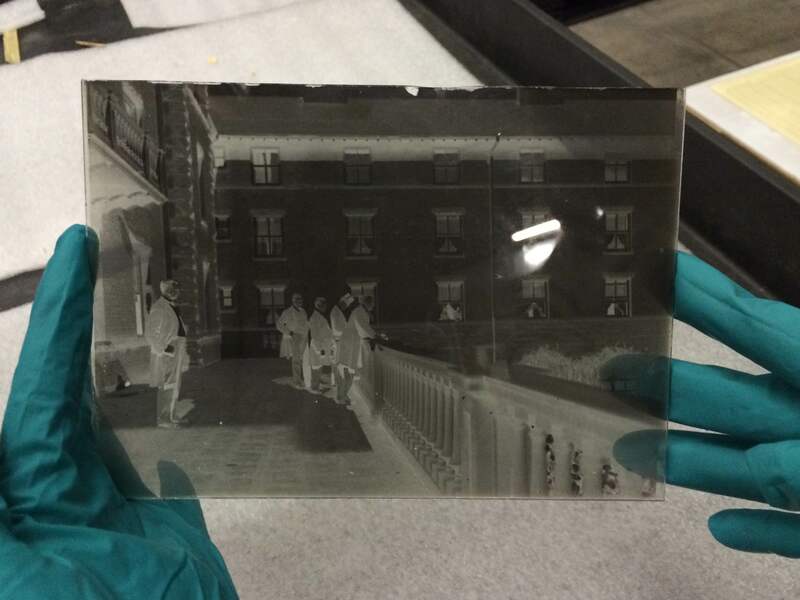 Glass plate negatives are extremely fragile and can easily break; sometimes, the photo emulsion can peel or flake away from the glass, rendering the picture incomplete. To help protect the fragile glass plates during a move between collection storage facilities a few years back, the negatives were packed in cardboard boxes with lots of foam padding for protection. 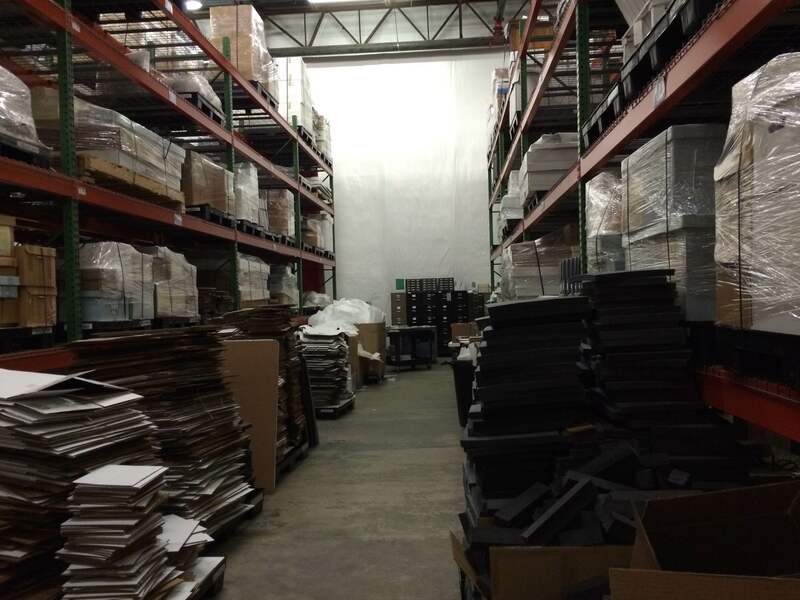 In the process of unpacking these boxes at the new facility we generated a lot of piles of foam and cardboard boxes. A lot! The Aultman Studio of Trinidad, Colorado, was the state’s longest-operating photo studio. History Colorado holds approximately 50,000 glass plate negatives depicting portraits of residents from southern Colorado, as well as scenes shot in and around the Trinidad area. The images were mostly shot by the father-and-son team of Oliver and Glenn Aultman. Other photographs in the collection were shot by Oliver’s brother Otis. 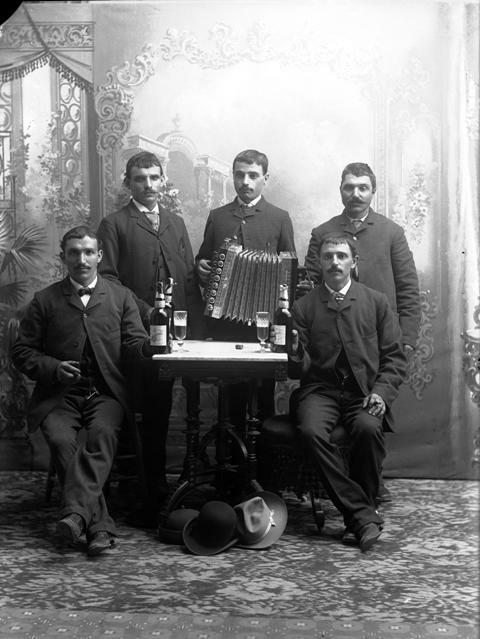 Full-length studio portrait of a group of men, including Peter and Barter, gathered around a table with bottles and glasses of beer. One man holds an accordion. 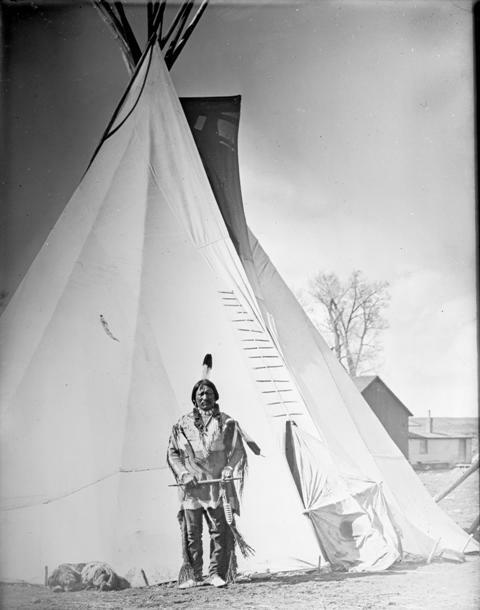 History Colorado holds the largest collection of William Henry Jackson photographs shot west of the Mississippi: an estimated 10,000 one-of-a-kind glass plate negatives and more than 5,000 original prints. Jackson (1843-1942) is considered one of the premier 19th-century landscape photographers of the American West. From 1870 to 1878, he was the official photographer for the U.S. Geological and Geographical Survey of the Territories conducted by Ferdinand Vandiveer Hayden; he first came to Colorado with Hayden in 1873. 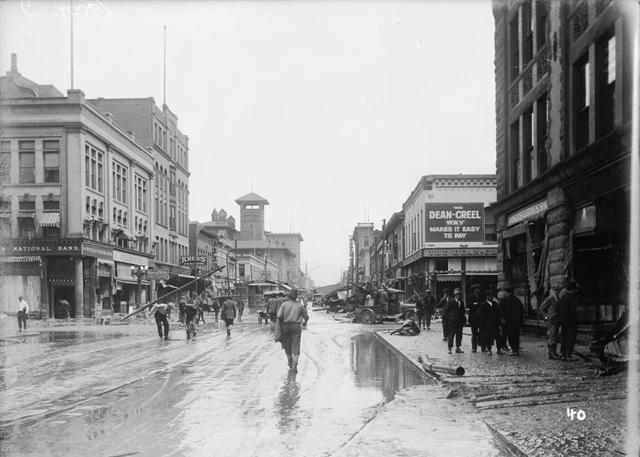 From that time until he left the state in 1898, Jackson was closely associated with Colorado; he opened his own photography studio in Denver in 1879 and continued to photograph the landscapes, people and towns of Colorado until the early 20th century. 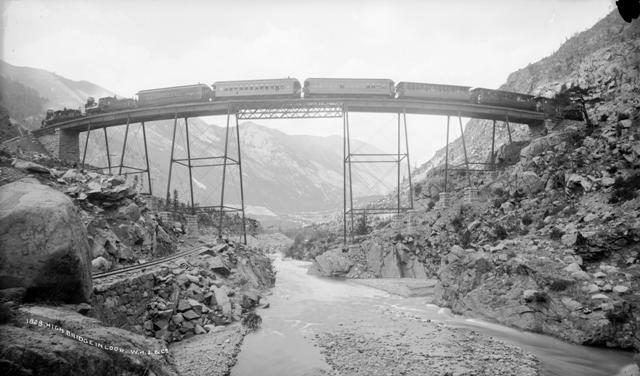 View of Georgetown Loop Devil’s Gate High Bridge in Clear Creek County, Colorado on Union Pacific, Denver, and Gulf Railway Company line with two locomotives, five passenger cars and caboose atop the bridge. H. H. Buckwalter was the first newspaper photographer in Colorado and an early moviemaker. The negatives in this collection depict Buckwalter’s travels around the state, including still shots from some of his silent movies, Native American tribes and early experimental x-ray photographs, among many other subjects. The negatives range in date from 1890 to 1925. Ola Anfenson (1874-1970) was a retoucher and colorist for Frank Dean, a Grand Junction photographer, before she opened her own gallery in De Beque, Colorado, during the oil boom in 1910. Ola met fellow photographer Fred Garrison around 1914 and moved to Rifle, Colorado, to work in his studio. The two married a year later. The couple worked as a photography team, with Ola usually conducting the photo sessions and retouching, and Fred developing the photographs. Their photos are among the earliest to depict the town of Rifle and its residents. The glass negatives in this collection are from the corporate photo archives of the Denver & Rio Grande Western Railroad and were photographed from 1871 to 1952. Photos in this collection were shot as promotional material and depict regions and cities on the D&RG line, including every town and settlement along the route. The photographs also document mining, agriculture, manufacturing and industry throughout Colorado. Charles S. Lillybridge (1847-1935) ran his photo studio in a small house beside the South Platte River at 952 South Alameda Avenue from approximately 1904 to 1925. Lillybridge photographed day-to-day activities around Denver, including road construction, transportation, the manufacturing industry and leisure time. His photos also document the Denver region’s shift from agriculture to industry. 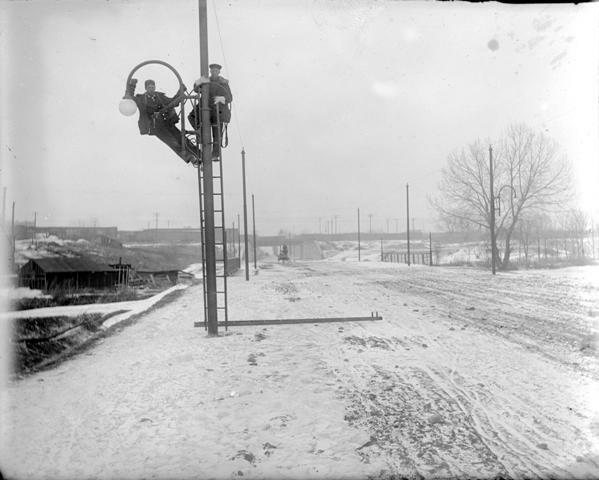 Men installing street lights on Alameda Ave. in Denver, Colo. 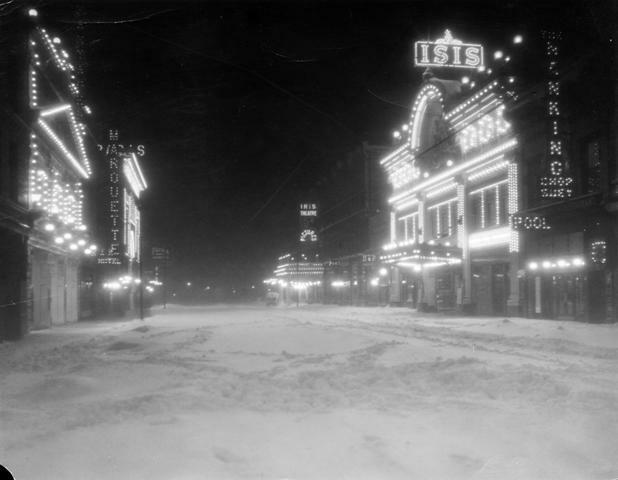 Some of our glass plate negative collections have been digitized and are available on History Colorado’s Online Collections and some are hosted on the Denver Public Library’s Digital Collections page (these will be available on History Colorado’s Online Collections very soon!). You can order reproductions of many of the images in our collection! The negatives are also available for research use in our Stephen H. Hart Library & Research Center. Requests to view glass negatives in the library must be made at least two weeks in advance by contacting photos@state.co.us. Permission to view and handle glass negatives is dependent on condition, size of request, and staff availability to retrieve the items from our off-site storage. Please contact photos@state.co.us for more information.